He took some antibiotics, not knowing his life would change forever. This was in 1998. His body reacted negatively to the antibiotics. Every organ in his body except the brain failed. Not even his heart was working. For two months, he lay in the intensive care unit dying. He spent one of the two months in a medically induced coma. Doctors said only a miracle would restore his fortunes. A miracle happened and he has lived to tell the story. However, Dean was left with chronic medical conditions, one being peripheral neuropathy. 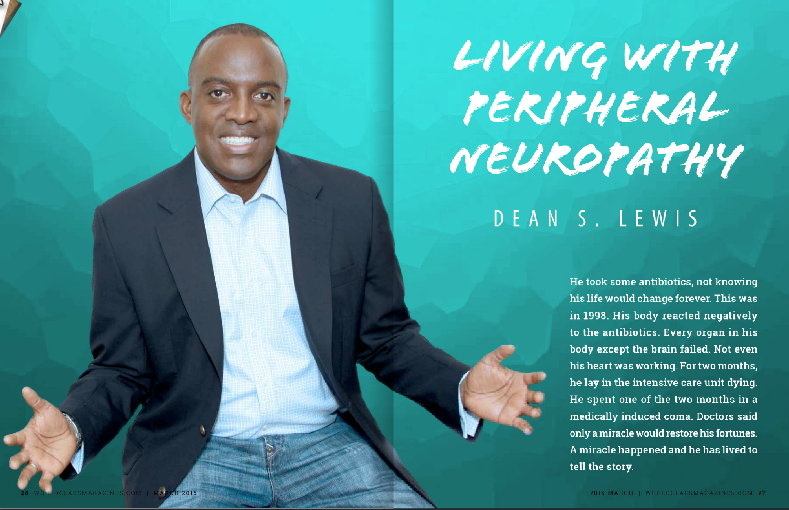 Dean has written a book entitled “Peripheral Neuropathy: Nine Simple Steps to Reduce Your Pain” which teaches others with neuropathy how to manage it. He also gives daily tips to people living with neuropathy, in their journey to overcome it. Dean is a fighter. While his parents worried about his life and whether or not he would leave the ICU alive, he believed he would somehow survive. He is now doing great. He has perfected ‘the art’ of controlling his neuropathy. Dean has a regimen he follows to keep his symptoms at bay. Some of the symptoms he deals with today include tingling in his legs. The tingling has, however, reduced significantly after strictly following his regimen. He is now a fulltime clinical analyst. He interacts with physicians, nurses and others in the medical field. His work involves implementing the medical practitioners’ requests for information from their database. He is also a life coach. Anyone with a chronic condition can contact Dean for help. He inspires many with his personal story of struggle, endurance and overcoming. Dean pursues his goals. He was able to attend World Cup 2014 in Brazil. He prepared his mind and body for the grueling schedule months before the trip to be in the most optimal condition. Dean practices gratitude every morning. He knows every day is a gift and is very grateful for one more day of life. He says he experiences numbness in his feet when he wakes up in the morning. So, he starts by getting his body to literally feel his feet. He exerts tension on his feet and muscles to allow his body to wake up in phases. Once this is done, he steps on the floor and does his cardio, stretches and pushups. This way, his muscles stay strong. This is very helpful when dealing with peripheral neuropathy. Dean says exercise strengthens the muscles and give the nerves the stimulation they need to keep the body fit. 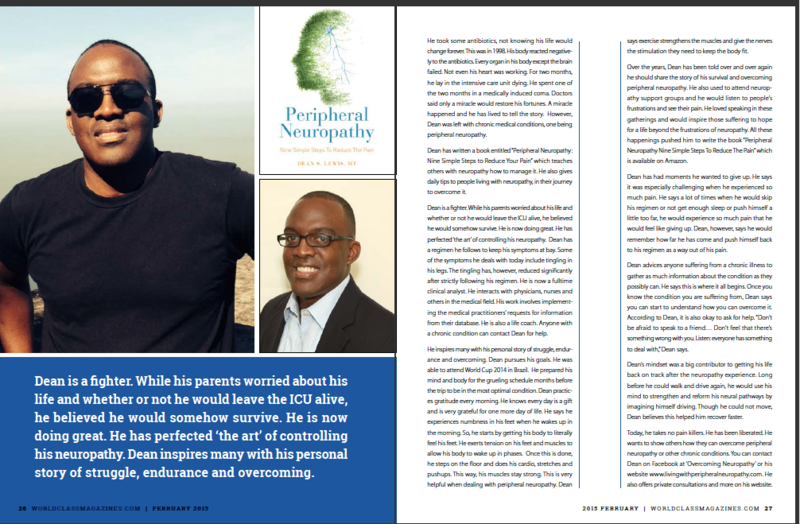 Over the years, Dean has been told over and over again he should share the story of his survival and overcoming peripheral neuropathy. He also used to attend neuropathy support groups and he would listen to people’s frustrations and see their pain. He loved speaking in these gatherings and would inspire those suffering to hope for a life beyond the frustrations of neuropathy. All these happenings pushed him to write the book “Peripheral Neuropathy Nine Simple Steps To Reduce The Pain” which is available on Amazon. Dean has had moments he wanted to give up. He says it was especially challenging when he experienced so much pain. He says a lot of times when he would skip his regimen or not get enough sleep or push himself a little too far, he would experience so much pain that he would feel like giving up. Dean, however, says he would remember how far he has come and push himself back to his regimen as a way out of his pain. Dean advices anyone suffering from a chronic illness to gather as much information about the condition as they possibly can. He says this is where it all begins. Once you know the condition you are suffering from, Dean says you can start to understand how you can overcome it. According to Dean, it is also okay to ask for help. “Don’t be afraid to speak to a friend… Don’t feel that there’s something wrong with you. Listen: everyone has something to deal with,” Dean says. Dean’s mindset was a big contributor to getting his life back on track after the neuropathy experience. Long before he could walk and drive again, he would use his mind to strengthen and reform his neural pathways by imagining himself driving. Though he could not move, Dean believes this helped him recover faster. Today, he takes no pain killers. He has been liberated. He wants to show others how they can overcome peripheral neuropathy or other chronic conditions. You can contact Dean on Facebook at ‘Overcoming Neuropathy’ or his website www.livingwithperipheralneuropathy.com. He also offers private consultations and more on his website.